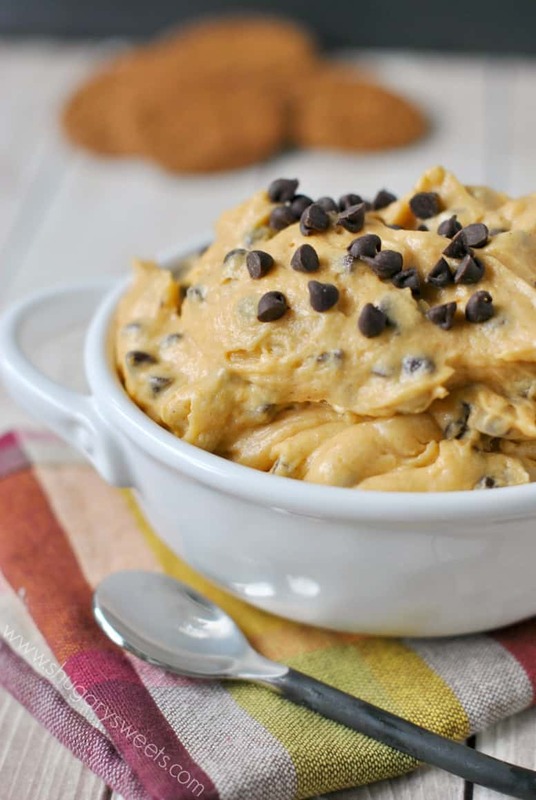 This Pumpkin Chocolate Chip Cookie Dough Dip needs to be at every fall party! Serve with some pretzels, graham crackers, or my favorite: Gingersnap cookies! So there are times on the blog that I make a recipe, and it could be MONTHS before you ever see it here. Not that it’s a “bad” recipe, I just have so many to share, there has to be a certain “order” to how I share my recipes. And then, there is the moment of taking one bite of a recipe and I know I need to share it immediately. Today’s recipes was one of those, “OMG you NEED this in your life, yesterday” recipes. Wednesday I was planning on making a cheesecake. But, I only had one block of cream cheese. I also had a small bowl of pumpkin in my refrigerator, leftover from making some Pumpkin Spice coffee creamer. 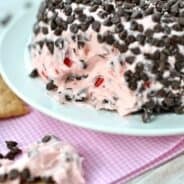 After much thought (about 1 minute) I decided to make a cookie dough dip. They seem to be wildly popular here on Shugary Sweets. 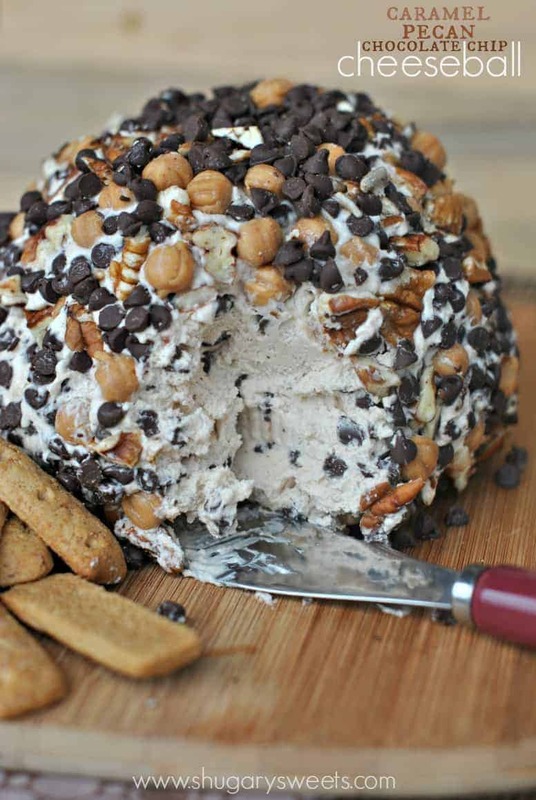 This Reese’s version went viral immediately, and still is made and enjoyed by so many of you! 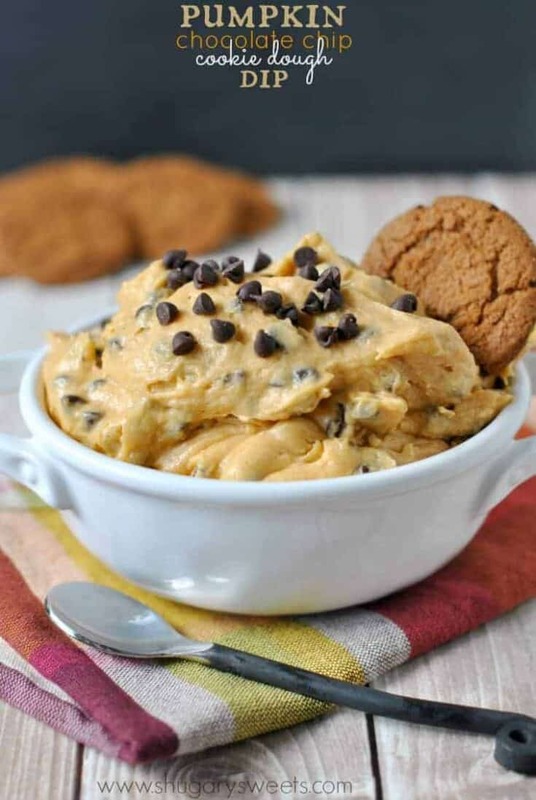 Last year I made a healthy pumpkin pie dip that was so creamy and good…I knew today’s recipe would be a winner. Then I googled pumpkin cookie dough dip and realized there are LOTS of geniuses out there. Kudos to you all! Heating the pumpkin and cinnamon instead of adding them in with the cooled cream cheese mixture results in a much creamier texture. Trust me. Allow the pumpkin mixture to cool COMPLETELY before adding it to the cream cheese. It will never set up if you add it warm. Refrigerate dip for two hours (more or less). It allows the flavors to mingle, and gives the cream cheese time to firm up again with the pumpkin mixture. Serve with gingersnaps. You will LOVE the tasty snap of the cookie with the pumpkin dip. Also good dippers include pretzels, apples, Nilla wafers, and graham crackers. Have a big crowd? Double the recipe. You’ll thank me later! Now, go make a batch of this Pumpkin dip and let me know if you think I’m a genius too! ha! In a small saucepan, combine butter, brown sugar, pumpkin and cinnamon. Heat on low and whisk until smooth (and butter is melted). Remove from heat and whisk in vanilla extract. Set aside to cool COMPLETELY. In a large mixing bowl, combine cream cheese and powdered sugar. Beat 2 minutes until blended. Slowly add in the cooled pumpkin mixture. Beat until fluffy (about 3-5 minutes). Refrigerate and allow to set, about 2 hours (or overnight). Enjoy with gingersnap cookies, nilla wafers, graham crackers or pretzels! 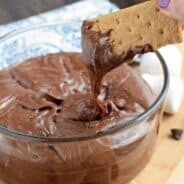 Looking for more dip ideas? I’ve got you covered! Cherry Chocolate Chip Cheeseball. If you don’t love pumpkin, then you MUST try this version instead! 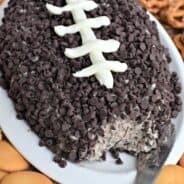 Turtle Cheeseball: I’m seriously in love with all sweet dips, as you can tell! 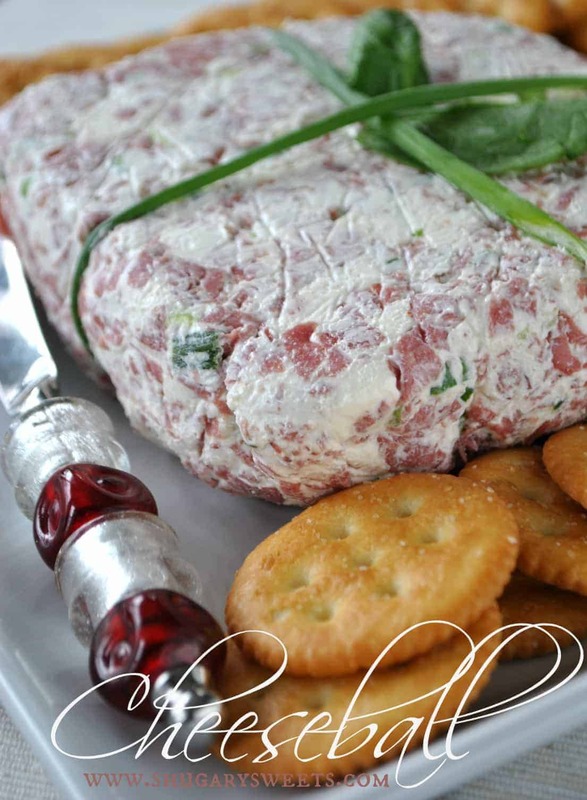 Ham and Onion Cheeseball: a delicious SAVORY dip recipe! I can’t wait for your book to be out!!! I’m sure you feel the same way 🙂 I’m headed over now to check out your pumpkin goodies!! this looks delish!! Any thoughts on using coconut oil in lieu of butter?? Think that’s an okay sub? I haven’t tried it. If you do, let me know how it turns out! Oh man, this looks dangerous. I don’t even need the cookies – just give me a spoon! I wouldn’t have been able to wait to post this, either. 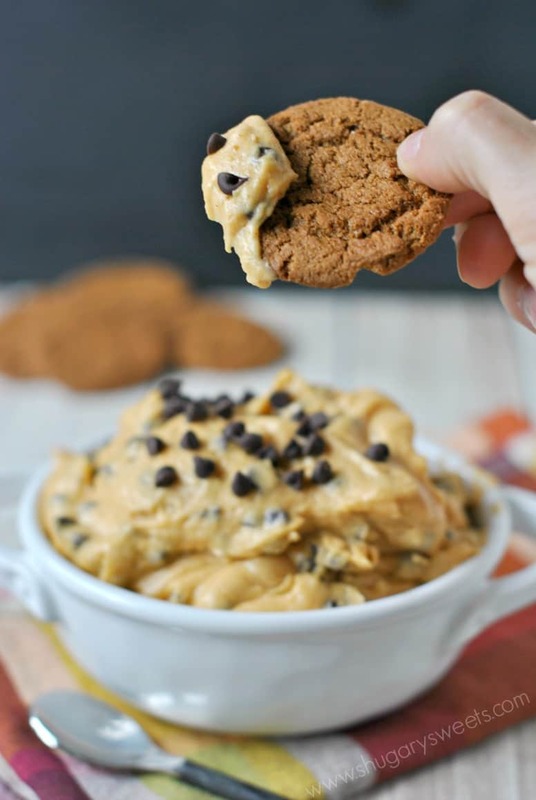 What is better than dipping cookies into cookie dough dip? PUMPKIN?! You are definitely letting your baking madwoman out here. Loving it! 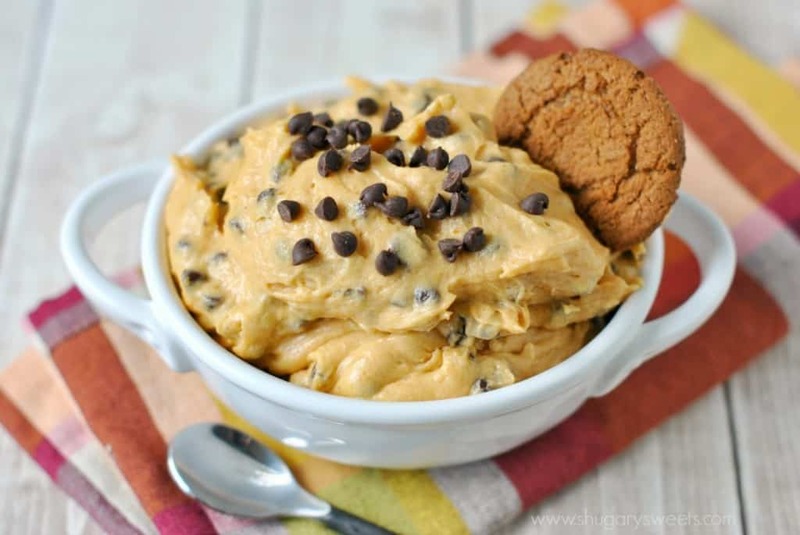 Pumpkin and cookie dough…yummy! Ginger snaps are my favorite dippers too for pumpkin dips. You are a food genius, and don’t let Google burst your bubble! Haha. I’d be all over this dip, and probably wouldn’t share. HAHA! I love the food genius part! This looks incredible! I wish we were neighbors! I need this dip! 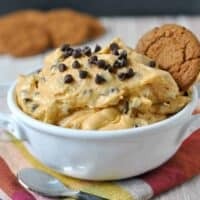 I love this spin on cookie dough dip. It always vanishes at my house! Yes! You are pure food genius, Aimee. 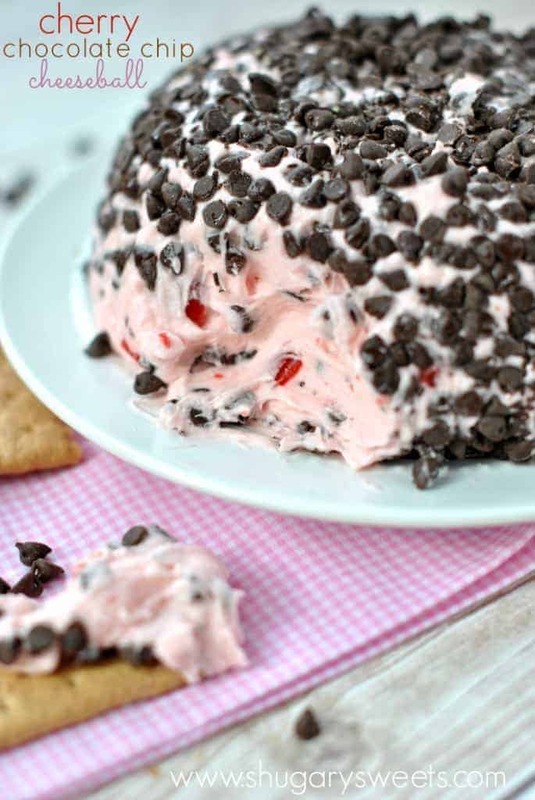 I can’t wait to make a HUGE bowl of this mouth watering dip. I loved your pumpkin pie dip from last year! Can’t wait to try this one! Yum…your dip looks amazing, Aimee! Pinning! You’re right, I needed this in my life yesterday, and this morning, and this afternoon and right now and probably tomorrow too. Bhahahaha! So funny to me because I made a sweet pumpkin dip this past weekend and thought I was all sorts of awesome genius…only to have google burst my bubble!!! I love that yours is cookie dough and chocolate chip. I don’t think I want a cookie…a spoon will work just fine! Ok, yep – this is yum times 100!! Gotta try this dip this season!